K9 series two is still in the works with over half the finance secured, given the world's economic climate that is quite an achievement so far. The new year will see further developments there. Series one has gained momentum in other territories, Russia, Turkey on ATV and the Cartoon Network across Asia and still appears on Disney XD. 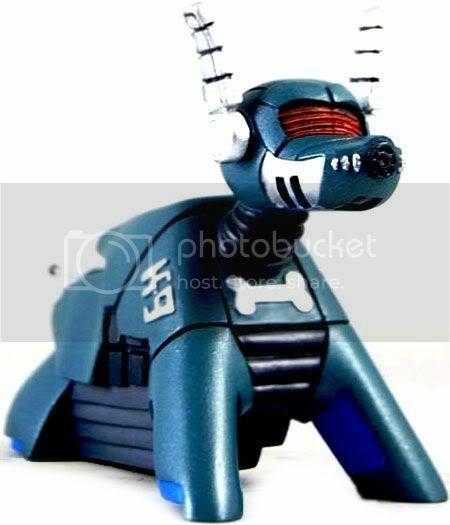 I can reveal that an upgrade to the new look K9 has been done which we are very happy with. We have also been very busy with the development of two other TV shows, unrelated to K9, but hopefully fans will like them, news next year on them. In the meantime both the first and second volumes of Series One are still available on DVD. The Complete Book of K9 is to be released next year, with pre-orders expected to begin in February. The glossy hardback book is in full colour featuring the life and career of K9, from his travels in time and space with the Doctor to appearing in his very own series. With anecdotes from many of the people involved with K9 over the years, the volume also features exclusive never seen before designs, photos and behind the scenes stories. Delayed from September, The K9 Story Book is now expected to be released to tie in with a repeat run of Series One on Channel 5 next year (dates to be confirmed). The full colour book features short stories, comic strips and behind-the-scenes features. Also released imminently is a collectible K9 Figurine, a display figure designed to complement the Character Options range. A limited edition version with signed postcards has been made available through The Who Shop, and the figurine will be generally available from other retailers from 10th December (pre-order from Forbidden Planet). Updates on merchandise etc. can be found via the K9 Official website and through Facebook. Doctor Who - favourite show for Christmas? Consider Yourself ... with Doctor Who! Two Doctor Who episodes recovered!